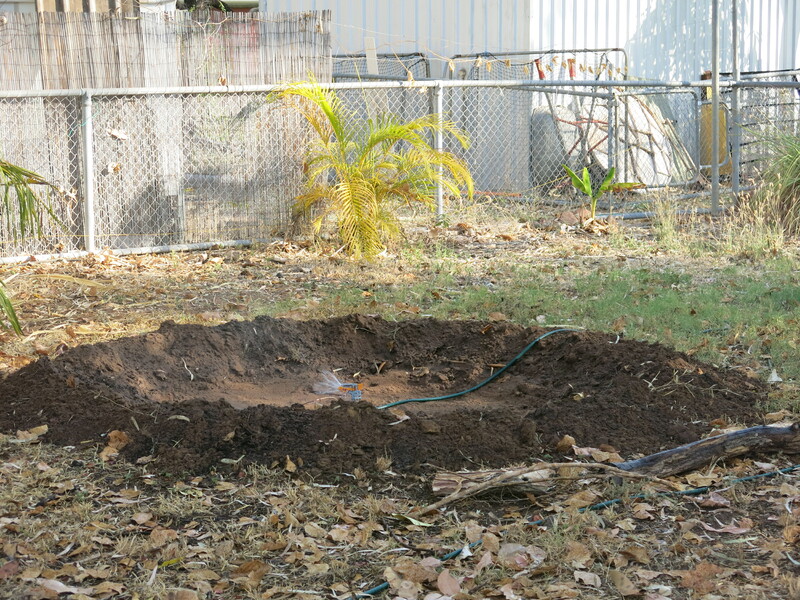 These school holidays mark a year since we first dug out and built our banana circle. It was our first attempt at applying permaculture practices in our garden and its fair to say it’s been a reasonable success. More on that later, first here’s an overview of how we built it. As with all the new knowledge we’ve gained it begun with a lot of googling. 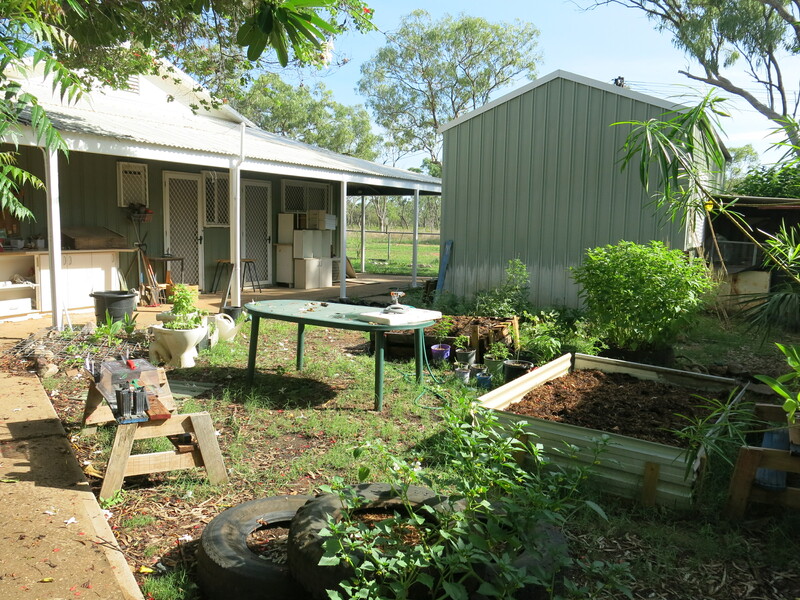 After sifting through some sites we pretty much settled on the design from the treeyopermaculture site. Minus the taro and the cassava as they weren’t available to us. With the design chosen we then set out to find a site in the backyard. 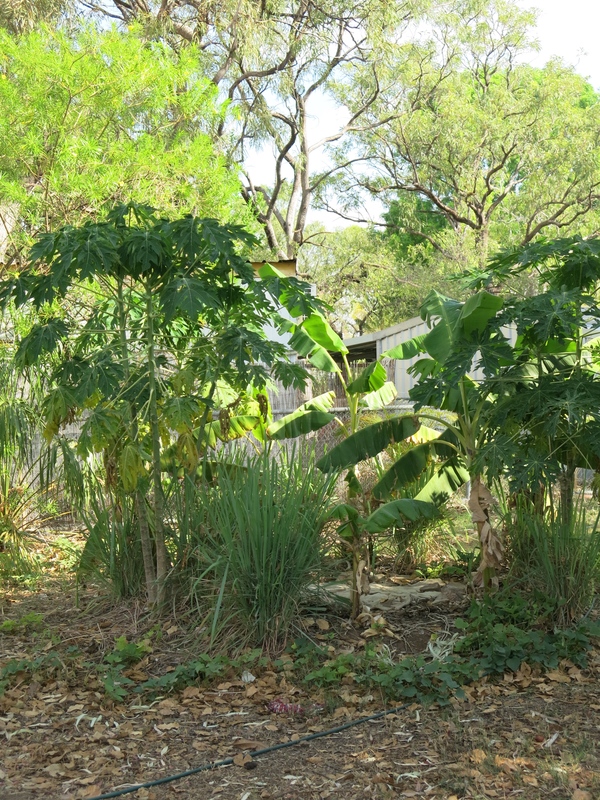 We went with a sandy area of the backyard for both practical and aesthetic reasons: practically it would be easier to dig; aesthetically it meant from our kitchen sink we could see the lush green banana palms as they grew. Site chosen, we began by marking out the area with a piece of string and some sticks. Per the instructions we marked out two concentric circles. One a metre in diameter, the other 2 metres in diameter. With the two circles marked out we then sprayed the grass in between the two circles to ensure we would get no grass growing back up through the soil. A week later we set to digging out the hole. It was harder work then we envisaged as the sand was only the top layer of soil. Underneath was hard earth. With lots of water and working in shifts we dug out the centre circle to a metre in depth, taking the earth from the centre circle and piling it up on the outer circle. Sprinkler soaking the ground mid dig. Soil from centre circle piled up in outer circle. Next was to fill up the middle with the compost. To do this we laid out some smallish branches we had lying around and put these at the bottom of the pit. 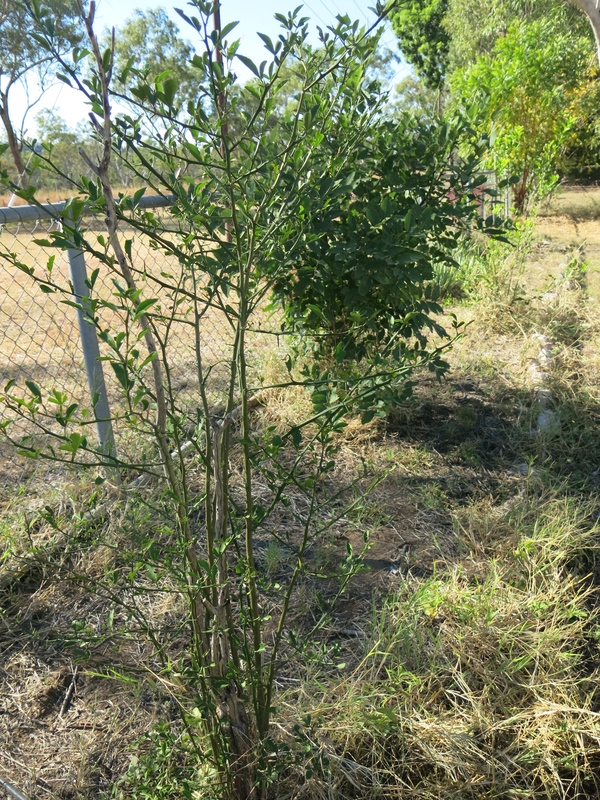 On top of this we added leaves from around the garden, grass clippings, some cow poo that we collected from the cattle yards down the road and some blood and bone. 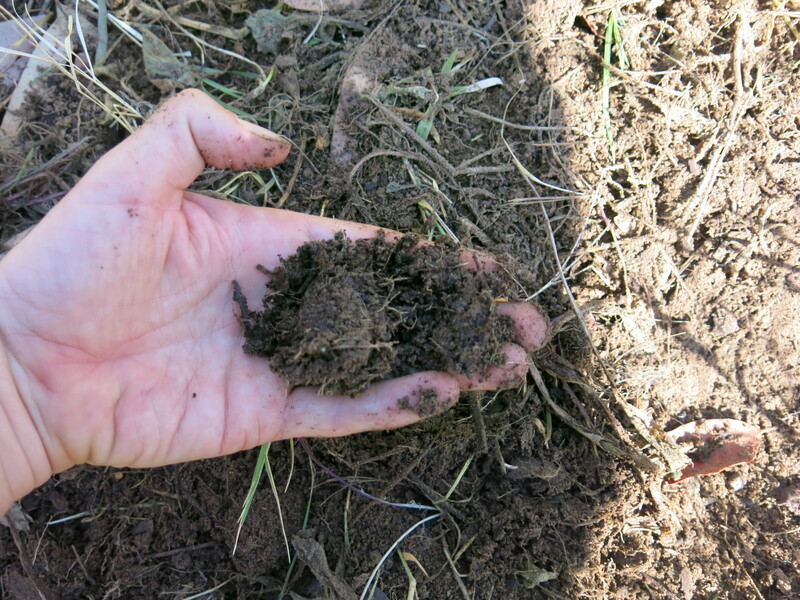 To the mounded soil we also added some cow manure and blood and bone. We then let the circle sit for a couple of days. A couple of days later we planted out the circle. The banana suckers we harvested from some ineffective banana circles at school. These were placed at roughly 2,4,6,8,10 and 12 on the clock. Either side of the bananas we planted out some lemon grass- divided from a large plant in the back corner (you can see the rest of the plant in the photo below.) We then planted some water melon seeds and sweet potato (we used the ends of store bought sweet potato that we had been saving). These were planted around to act as a living mulch. 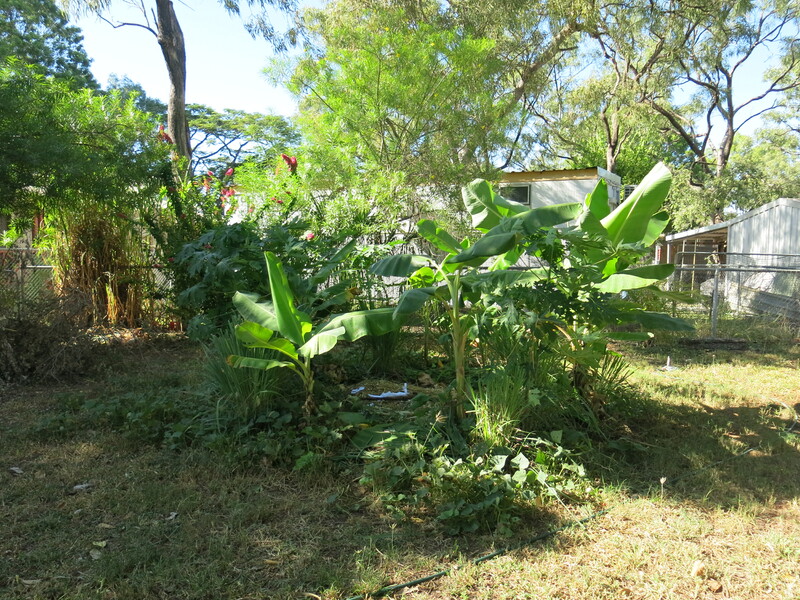 The banana circle a month or so after planting. 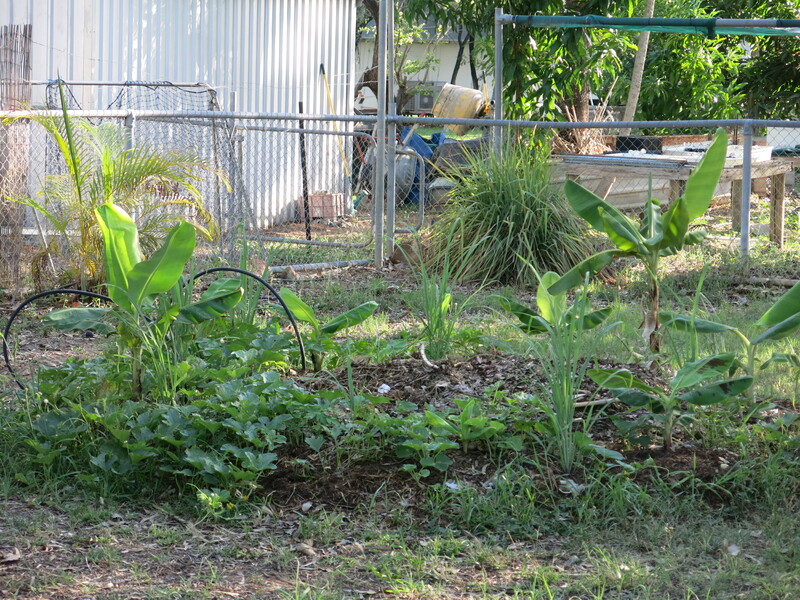 Sweet potato and watermelon are growing around the edge and the banana’s have established. As the photos below show the banana circle has grown from that hole in the ground in October last year to the maturing grove of this year. Banana circle, end of March 2015. Banana circle, early October 2015. We’ve also changed and added some things as the year has gone on. Early December 2014 we added some paw paw to the circle. 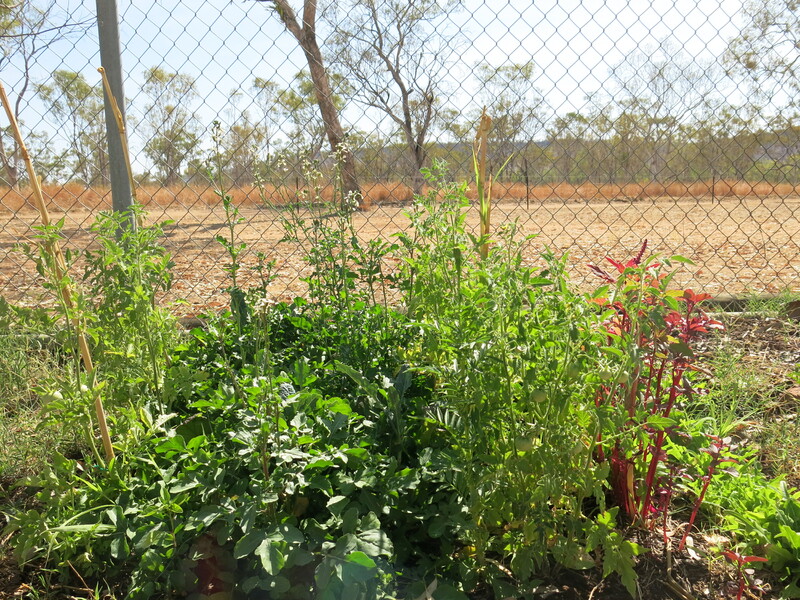 We harvested seeds from paw paw we brought at the Broome Markets. They take a long time to germinate (we found they germinate quicker if you just pop them in potting mix without soaking overnight as many google sites recommend). We thought that they would work well in the circle but in hindsight it would have been better to plant out two circles- one with paw paw and one banana – to stop competition for nutrients. To make it easier access to the compost pile in the middle we removed one of the lemon grass. Earlier this year we also started using laundry grey water on the circle. In hindsight we would add a piece of pipe to act as an outlet to feed the grey water into. 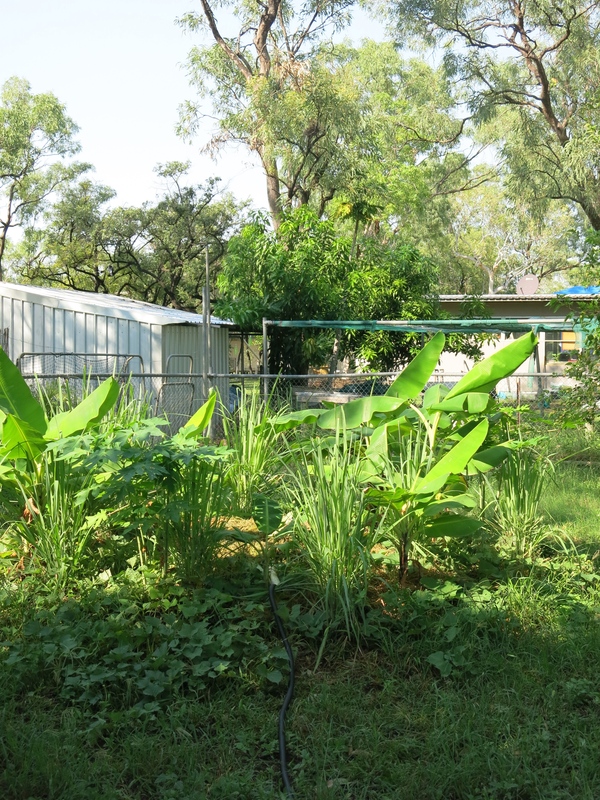 In April this year we tried planting chilies around the banana plants after hearing how they were pest deterrents. With the bananas and paw paws well established the chilies had little chance at getting the nutrients they needed. Next time we would look at planting the chilies at the same time as the banana suckers. 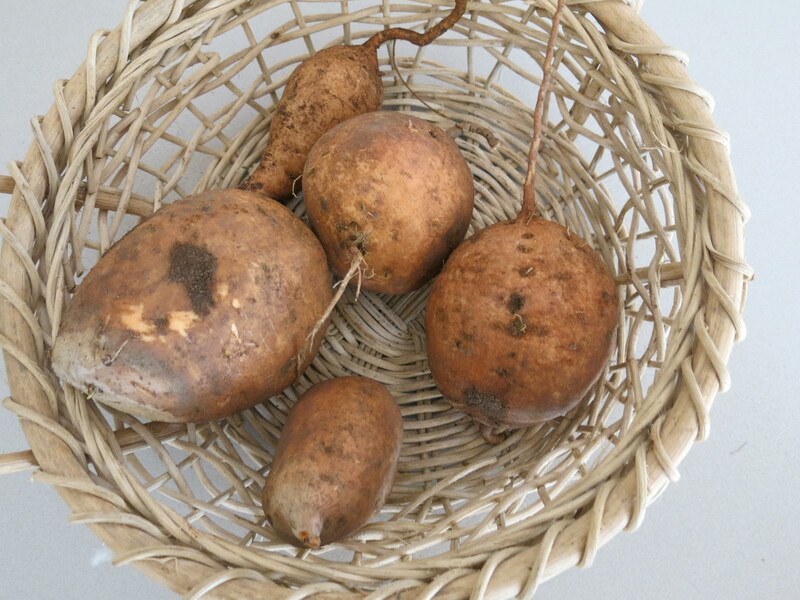 Whilst we have yet to have any bananas or paw paws from the circle we have managed to harvest 15- 20 sweet potatoes, with more to come. We’ve also had the pleasure of eating a watermelon and used the lemon grass in multiple dishes in the kitchen. 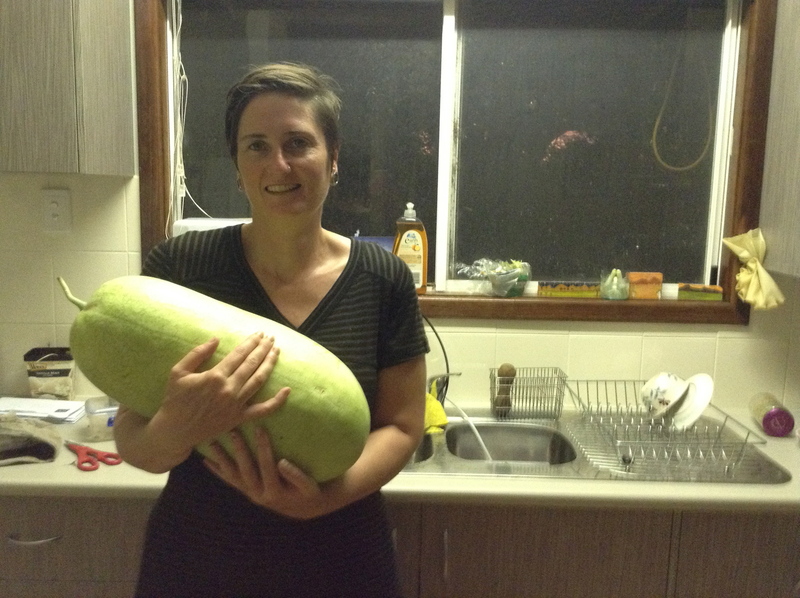 Deirdre and home grown watermelon, February 2015. Sweet potato harvest, October 2015. The circle has also acted as an effective and efficient compost pile. Many a times we have pilfered from it to use else where in the garden . The lemon grass also is an easy mulch to harvest. Every month or two we give them a hair cut and spread the leaves around the garden or into the centre of the banana circle. Finally there’s the aesthetic pleasure it’s given us. Sure it’s purpose is to produce fruit but as any gardener knows the visual side can be as pleasing as the eating side. And that’s certainly the case with this. Both Deirdre and myself enjoy sitting out the back, coffee in hand, looking out at the banana circle. Particularly when the straw necked ibis is stalking around the edges scratching away for insects. So it’s just over two years now since we’ve been here at Kupungarri. A period of time that’s gone both quickly and slowly in that way that time in a remote community does. It’s had its challenges: a dozen snakes; 500 km shopping trips; blurred lines between work and social life. But to be honest we can’t really complain. 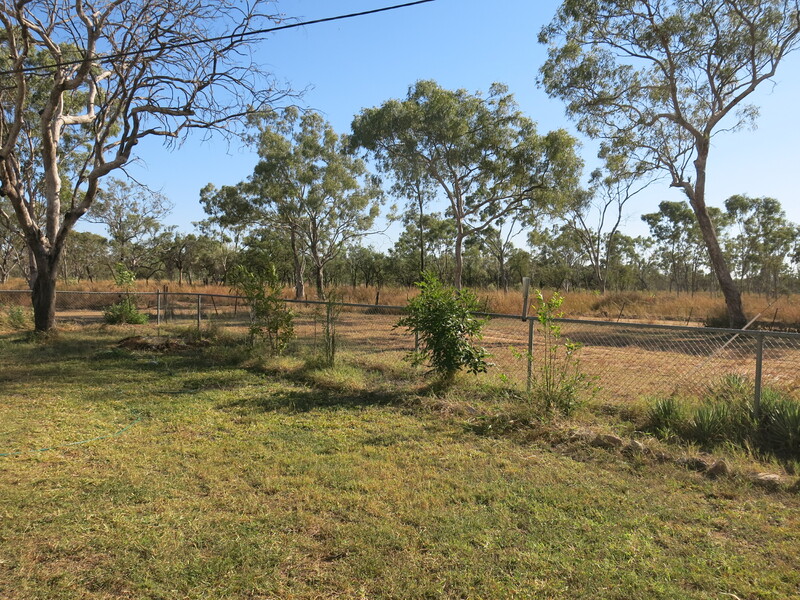 The remoteness has provided us with both the time and reason to do a lot of work around the yard. And work we have. 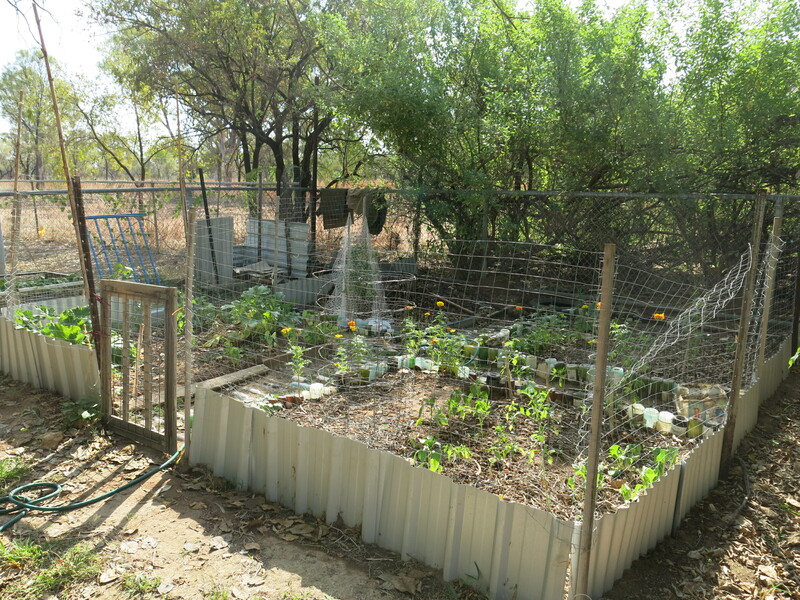 Over the last 18 months we have created our own vegie patch, a banana circle, two no dig garden beds, converted to empty into wicking beds, made a garden pond and planted out a little mango grove. 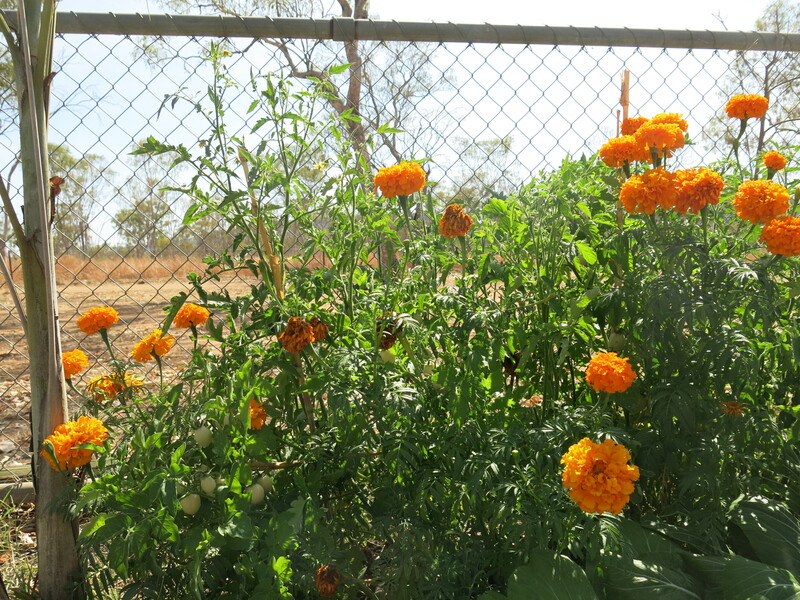 In total we’ve grown over 50 different edible plants with various degrees of success. One of the most successful transformations has been along the front fence. What for year and a half had been nothing but a patch of grass ( see photos below) was converted earlier this year into a couple of veggie beds. Planted out with tomatoes, pumpkin, kale, mustard green, lettuce, marigolds, chicory, dill, coriander, shingku, and carrot. The beds add a splash of colour against the dry season landscape as you can see in the background (beautiful but harsh). Well until last weekend they did. With school holidays upon us we headed into Broome for a weekend away. Sprinklers and timers set we were expecting to come home to the same lush garden we left. In my rush I didn’t put one of the sprinklers on properly and it come off. Leaving us with a garden bed of wilting tomatoes and marigold and dead shrivelled chicory. 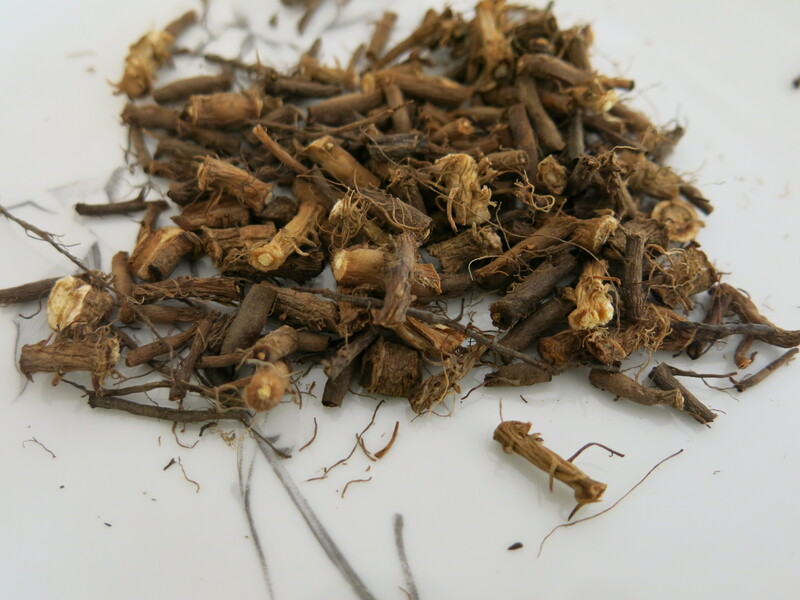 It was frustrating but there’s always an upside…the chicory roots. I’d planted them out as an experiment of sorts to help break down the soil. 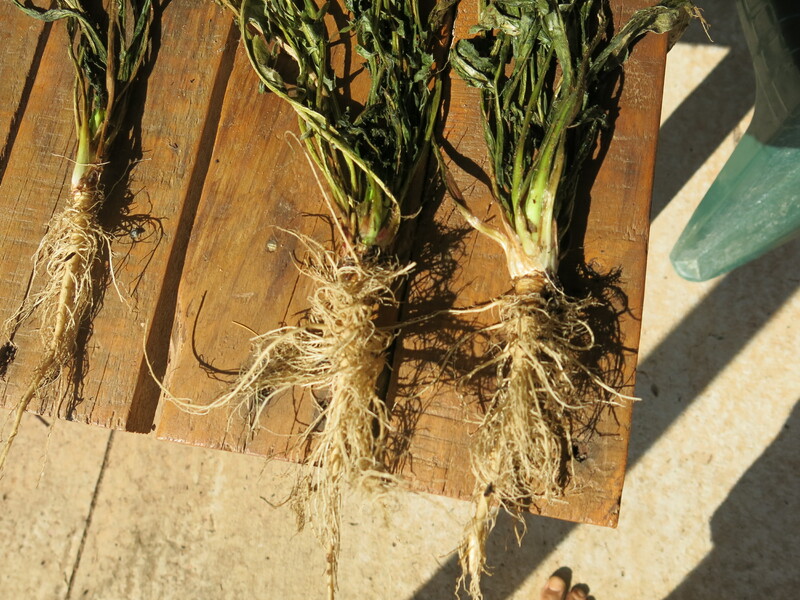 The ground when planted was dry and heavy with clay and chicory with their long taproots and extensive hair roots breaks through the soil and aerates it. 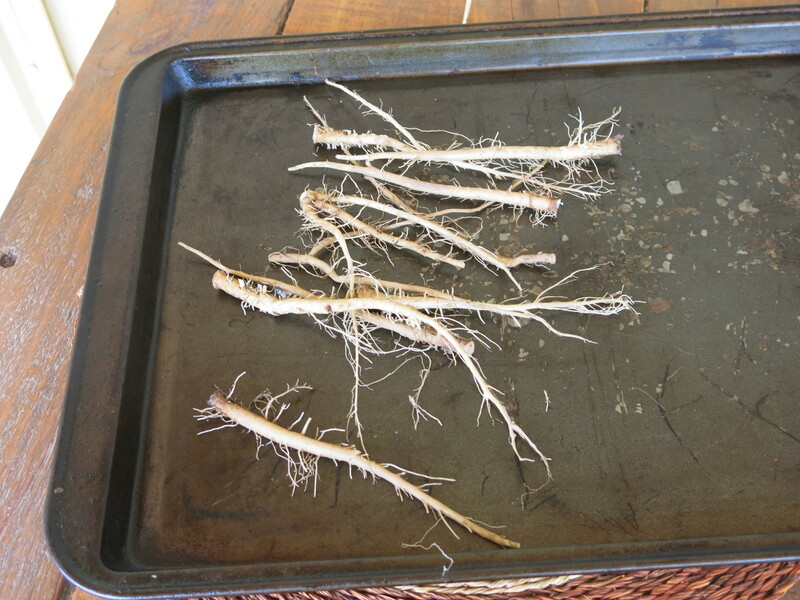 The roots can also be used as a coffee substitute. My frustration had subsided and now I was intrigued to see how effective this experiment had been. 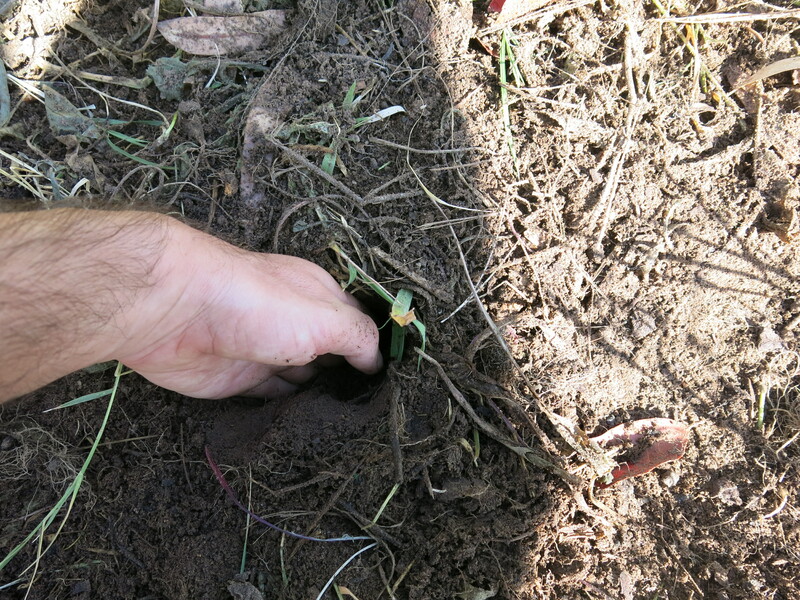 Come the following morning I was up early (to beat the heat) in the yard watering digging up the chicory roots. 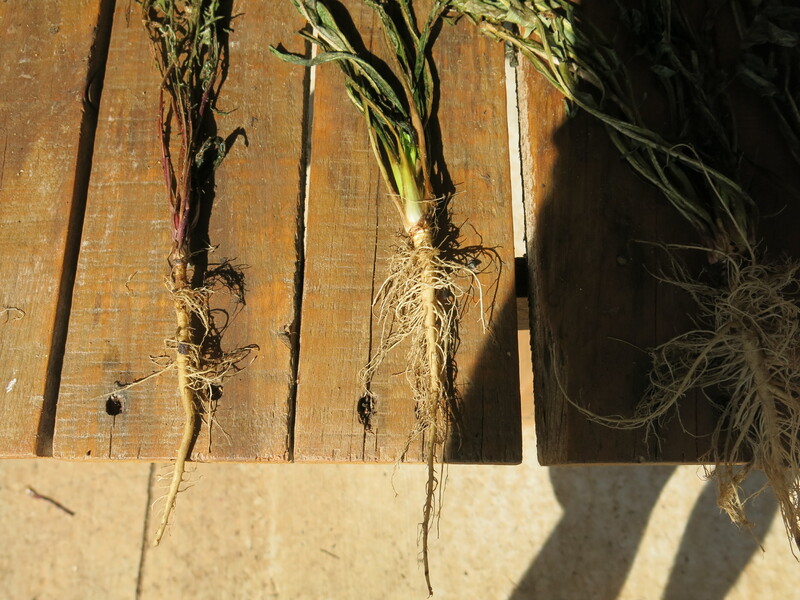 Some of the roots were tangle and small from not being thinned out but the impact on the soil was better than expected. I don’t have a photo of the soil before, but as you can see from below the soil is now lose and crumbly. With a little scrubbing, and some scissors to remove the hair roots, I was able to get a few longish roots and took them inside ready to roast in a moderate oven (180 C) for 30 minutes or so. And then I burnt them, but was able to salvaged some unburnt bits. I ground it up and brewed it in our stove top. The ‘coffee’ was nutty and earthy with a slight astringent after taste. I didn’t mind it, Deirdre’s still to be convinced. A project to be perfected.